Didn’t I say, just last month, keep your eyes on Ross Wimer? Now you can. Yesterday I went to visit Ross, to see what new work he’s up to. On my way there, on the newstand I spot the magazine above! Daily Dose notwithstanding, this is the magazine of the moment. 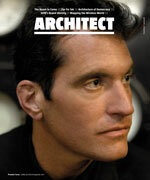 The premiere edition of Architect magazine. And on the cover, Ross. Well the new work he showed me is even better looking…. Including a great LED street lamp, of twisted steel. Very elegant. Mayor Daley, while you’re talking to Ross about the Olympics, you ought to ask him about the streetlight he’s got that would make our town look instantly more chic. Both because of the pole itself (better than those standard issue highway lights we’ve got all over town) and because they’d cast a whiter, less yellow light. The article featuring Ross is well-written, by a friend, the wonderful Cindy Coleman. Click here to read it. – Tell ’em Edward sent you. I just want to add, keep your eyes on Ross Wimer. He’s the hugely talented young star brought in from New York to Skidmore’s Chicago office. You are currently browsing the archives for the Wimer category.